Pilot Aptitude Battery Test (PABT). Pilot Aptitude Battery test is conducted for the candidates who aspire to join flying branch of Air-force, Navy, Army and Coast guard in Indian Defense Forces. Pilot Aptitude Battery Test (PABT) is aimed at assessing a candidate’s aptitude to be trained as a pilot. PABT is being used as an independent selection device to induct potential officers into Flying Branch of Indian Air Force. PABT comprises three tests viz Instrument Battery Test (INSB), Sensory Motor Apparatus Test (SMA) and Control Velocity Test (CVT). Instrument Battery Test (INSB) is a paper pencil test and other two are machine tests. The Instrument Battery Test (INSB) comprises two parts. 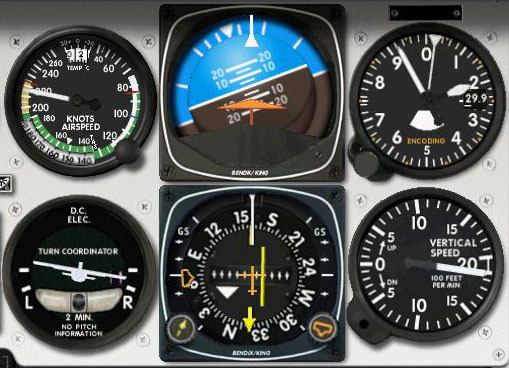 This test assesses assimilation of the briefing and the ability of an individual to read and interpret the dials of an instrument panel of an aircraft. The candidates who score the minimum laid down criteria are subjected to the machine test. The machine test includes Sensory Motor Apparatus Test (SMA) and Control Velocity Test (CVT). These tests measure the psychomotor co-ordination skill of the individual. These tests are conducted on a single day and administered only once in life time, and if you fail you cannot apply for flying branch again. Once you have passed this test you don’t have to appear for it again, if there is a next time, this score will be carried throughout. Foot-hand-eye coordination is tested through this battery of three different tests. 1.The Instrument Battery Test (INSB) . 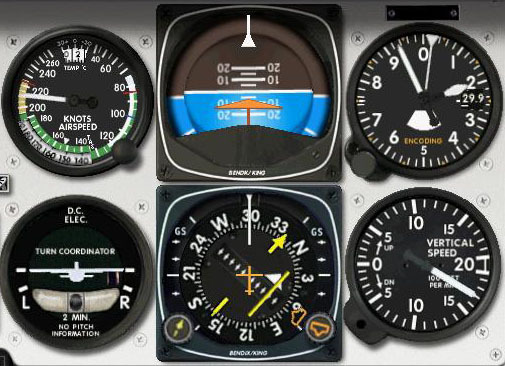 In this test the basic six instruments in an aircraft will be explained by the test instructor to the candidates. Only after clearing doubts of candidates the test will commence. These instruments are explained in complete detail containing each and every point needed for successfully qualifying the test. Hence, the candidates should listen to the officer with very receptive mind and make sincere efforts to understand every detail that is being imparted to them. Also they should keep away from silly questions and also try their level best to clarify whatever doubt they have, whenever the Officer asks them. 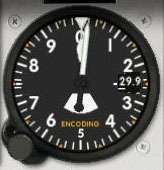 a) Airspeed Indicator: This instrument gives the indicated airspeed of the aircraft in mph or knots or whatever unit the dial indicates. Reading this dial is just like speedometer of car or bike. 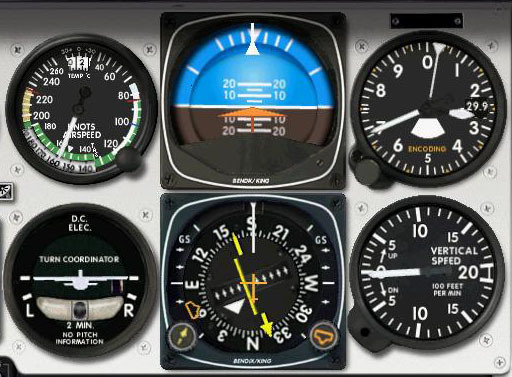 b) Artificial horizon/Attitude indicator: This instrument gives the pitch (nose up or down) and roll/banking (tilt of wing) of the aircraft. 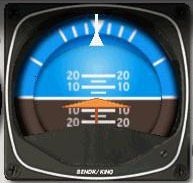 If you keep the wings level with the horizon line (line that divides blue color that denote sky and dark color denotes ground) on the instrument, then your aircraft will be parallel to the ground. 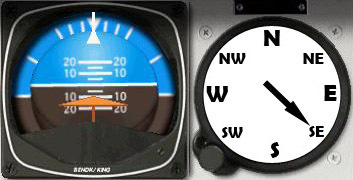 The attitude(orientation) indicator replicates the view that the pilot has out the windscreen if it is not obstructed by clouds or other meteorological phenomenon. 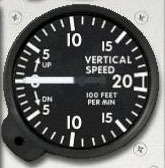 The attitude indicator, as its name implies, indicates the attitude of the airplane relative to the horizon. 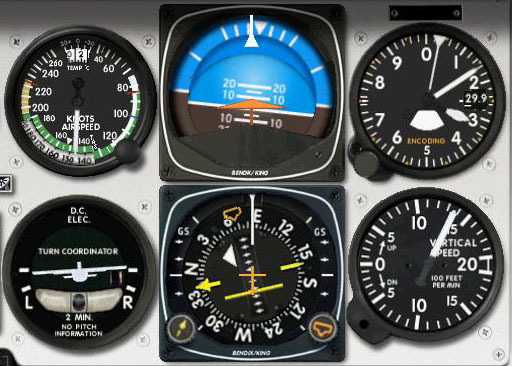 For this reason, the attitude indicator used to be called the artificial horizon. 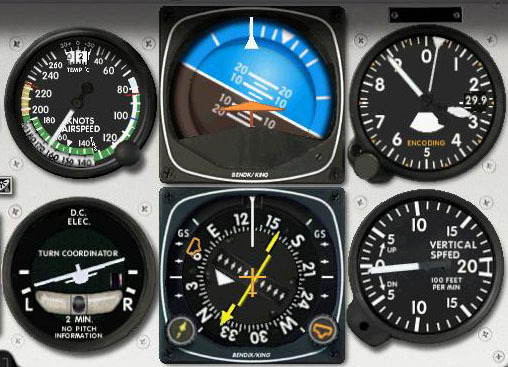 The attitude indicator displays airplane pitch (nose up or nose down attitude) and airplane bank (the angle which the wing makes with the horizon). Marks around the top half of the instrument indicate angles of bank of 10, 20, 30, 60, and 90 degrees. Pitch is displayed in 5° increments up to 20 degrees. 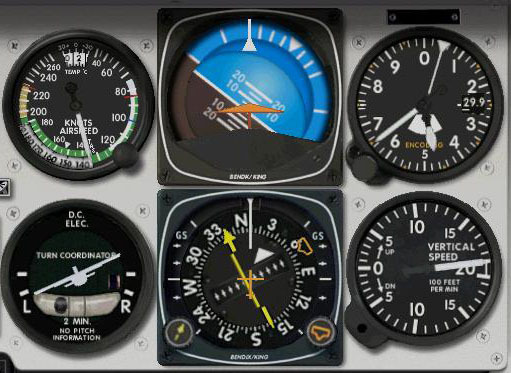 The attitude indicator is the only instrument in the airplane that reflects both pitch and bank. 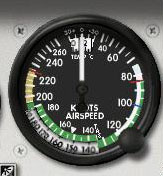 c) Altimeter: This instrument indicate the altitude(height) of the aircraft from the sea level. This analogue gauge contain one small hand which gives reading in thousands of feet and other big hand gives reading in hundreds of feet. The reading from both this hands combined gives the altitude. Just like reading time from clock. 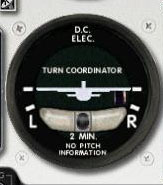 d) Turn coordinator: This instrument indicates whether we are applying right amount of rudder in a turn. The turn coordinator is actually two instruments in one. The airplane replica in the middle of the instrument rolls proportionally to the roll rate of the airplane. The second instrument in the turn coordinator is called an inclinometer. 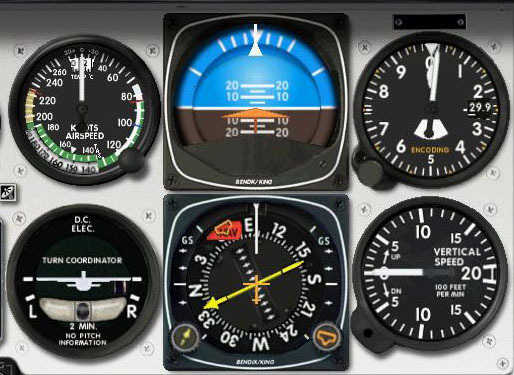 The inclinometer shows whether use of rudder and aileron is coordinated. If the ball in the liquid-filled glass tube moves outside of the center of the tube, the rudder and ailerons are not coordinated. 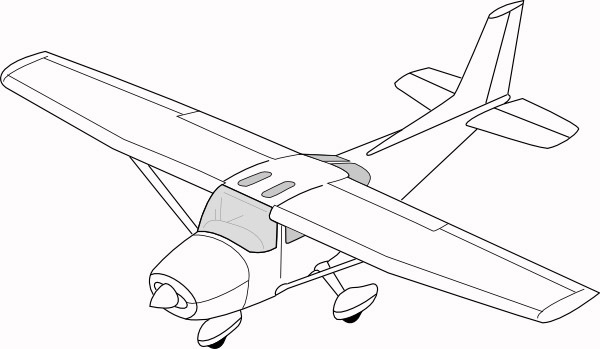 If the ball moves to the outside of the turn, the airplane is skidding(under turning). If the ball moves to the inside of the turn, the airplane is slipping (over turning). Uncoordinated flight can be corrected by applying more rudder pressure on the side that the ball is on. 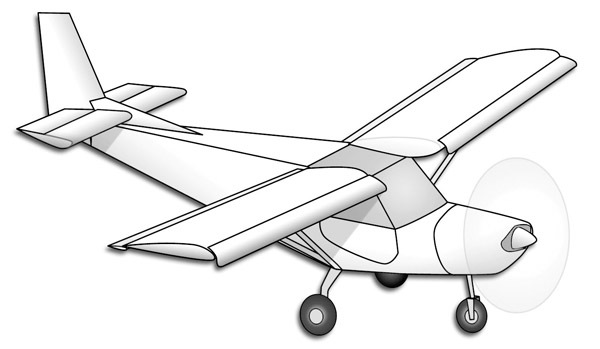 Student pilots are instructed to step on the ball, because the rudder is controlled by pedals, and pressure on the left pedal coordinates the turn if the ball is to the left of center. 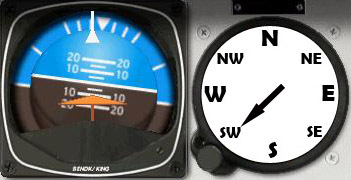 e) Heading indicator/Compass: This instrument gives the heading of aircraft in magnetic degrees. # The heading indicator is a gyroscopic instrument. 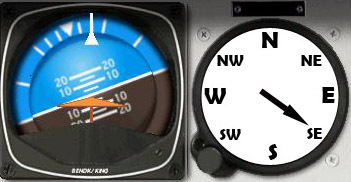 The heading indicator, also called the directional gyro, is used because a magnetic compass only works accurately when the airplane is flying straight and level in unaccelerated flight. 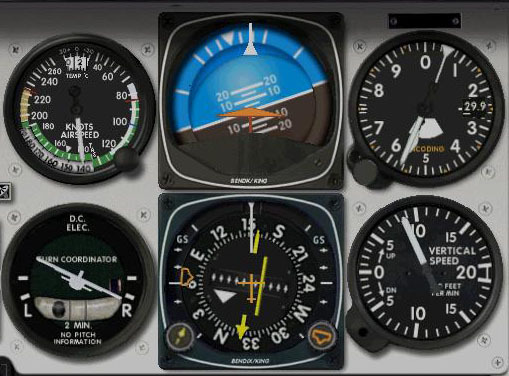 f) Climb and descend indicator: This instrument gives the rate at which aircraft gains or loose altitude. Unit will be in feet per minute. The region where arrow is shown is normal rate of climb and descend, and range above and below it is fast rate of climb and descend. After this instructor will give you a test booklet in which six instruments are shown with readings on it and you need to choose right answer from 5 option. Aircraft flying level not banking, airspeed 155, altitude 2680 feet above sea-level, heading south 180 degree, not climbing or descending. Aircraft flying level but banking 30 deg left, left wing down, turning left, airspeed 165 knots, altitude 2880 feet, not under or over turning (coordinated turn), heading 130 deg, not climbing or descending. Aircraft is nose down 10 deg, right wing lowered, banking right 20 deg, airspeed 215 knots, altitude 1920 feet, not under or over turning,turning right, heading 160 deg, descending at a fast rate of 2000 ft/min or more. Aircraft is nose up 10 deg, left wing lowered, banking left near 10 deg, airspeed 145 knots, altitude 3160 feet, not under or over turning, turning left, heading 85 deg, climbing at a fast rate of 1300 ft/min. Aircraft is inverted and nose up 5 deg, not banking, airspeed 210 knots, altitude 1920 feet, not under or over turning flying straight, heading 300 deg, descending at a fast rate of 1700 ft/min. Aircraft is nose up near 10 deg, left wing lowered, banking more than 30 deg left, airspeed 135 knots, altitude 4640 feet, over turning, turning left, heading 10 deg, climbing at a fast rate of 2000 ft/min or more. Aircraft is nose up near 5 deg, right wing lowered, banking right 20 deg, airspeed 140 knots, altitude 5560 feet, under turning, turning right, heading 150 deg south-east, climbing at a fast rate of 800 ft/min. 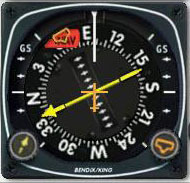 Two Instruments(Compass and Attitude indicator) as well as the Silhouette (Shape) of the aircraft will give given, the candidate has to choose from options. It consist of 60 questions which is to be answered in 20 min. • North(0 degree), NE(45), E(90), SE(135), S(180), SW(225), W(270), NW(315) etc. • Climbing up(elevating), Descending(moving down). 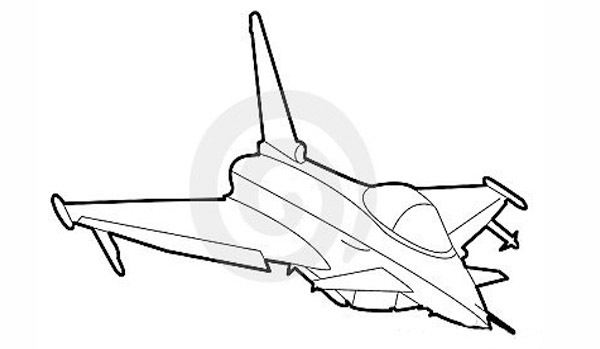 • If you see the nose of the plane, the plane is coming towards you and it is taken as moving towards south. • If you see the black dot of the plane, the plane is going away from you and it is taken as moving towards north. • If you see the plane moving in such a way that the nose is to your right and tail to your left, than the direction is taken as moving towards east. • If you see the plane moving in such a way that the nose is to your left and tail to your right, than the direction is taken as moving towards west. Now, when the direction has been identified the next observation has to be the ascent/descent. • If the nose is at a lower horizontal level than the tail, than the plane is surely losing height or descending. • If the nose is at a higher horizontal level than the tail, than the plane is surely gaining height or ascending. • If you see the belly of the plane, than the plane is losing height. • If you see the entire top portion of the plane than the plane is gaining height. • If you see the belly of the plane, than the plane is gaining height or ascending. 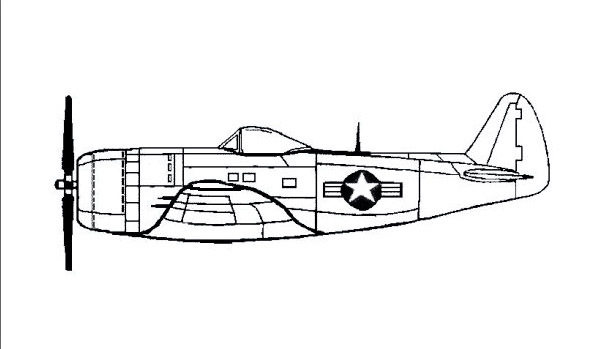 • If you see the top of the plane, than its losing height or descending. The same information can be extended to identify movement in NW, NW, NE, SE, SW directions. The candidates that come out as successful in the written test are taken for machine testing. 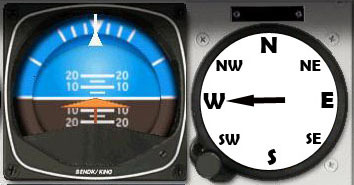 Based on the reading from both these instruments you have to choose one picture of aircraft from five that suits the orientation. Here reading and its corresponding picture is given. 2. Sensory Motor Apparatus Test (SMA). This test judges the reflexive capabilities of a candidate in response to external stimuli. In this test, the locomotive and sensory abilities of the candidates are put to examination. Each of the two constituent tests aims to find the eye-ear-hand-feet coordination of the person. Hence, you can come out successful only when you grasp the maximum in the shortest time and also apply the same within the short time duration. In each test, the candidate is given 3 chances to come up with good scores. The best score is counted of all the three. Each turn is of 90 seconds. In this test, a spot of light (ball) is to be maintained in the center of 2 concentric squares. The spot of light moves across randomly all over the screen. The longer the candidate is able to keep the dot in the center, the more marks he gets. Also, there are 2 lights, yellow and red which come up in the top left and top right corners of the screen intermittently. a) A hand operated stick: This stick controls the movement of the ball in up and down direction. It is of the shape of the gear-changer in cars. Moving the stick back moves the ball up and moving it in forward direction moves it towards the bottom of the screen (like joystick). 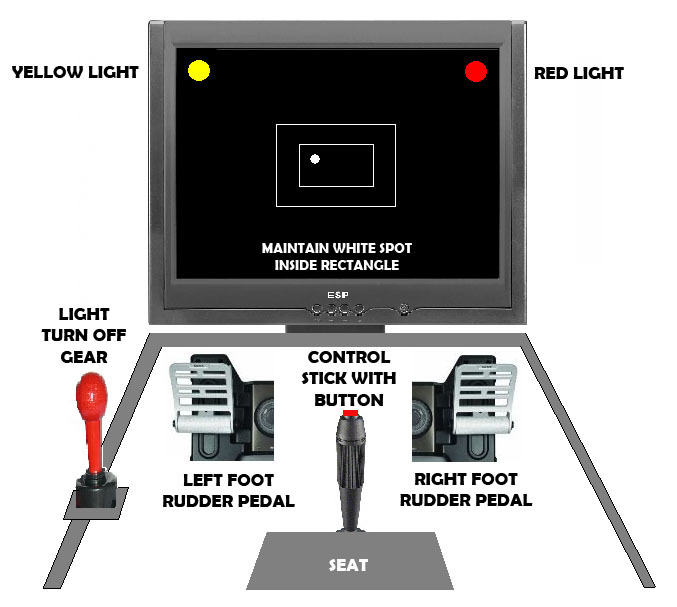 b) Foot pedals: The operation of the pedals moves the spot of light (ball) to right or left. c) Light lever: A hand lever is provided which when moved forward puts off red light and when backward puts off yellow light. d) Beep button: A button on the top of the stick is used for putting off the beep sound in the headphones. Here is a sample window for this test. Its exactly what you see at the screen at some random instant of time. One thing to remember is that the control pedal and stick are too old and these controls, does not respond quickly and if you have to move the dot up then you have to move the stick all the way up ie, it responds only at the extreme end. The same apply to rudder also. 3. Control Velocity Test (CVT). 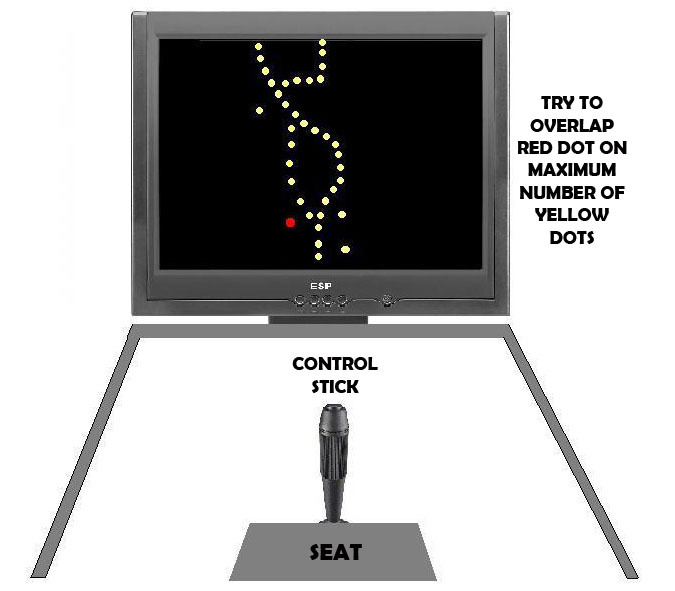 On your Monitor you will find a lot of dots coming from top of the screen and goes down. In this test, a spot of light (red) is to be superimposed on a series of yellow dots running on the screen from top to bottom. Whenever there is a successful superimposition, there is a small blip in the headphone. The more times you succeed in superimposing the red ball on the yellow balls, the more points you get. You will get three try of length 60 sec each in this test. As I said before the controls lag, if you go for sharp corners then you will miss more number of dots. 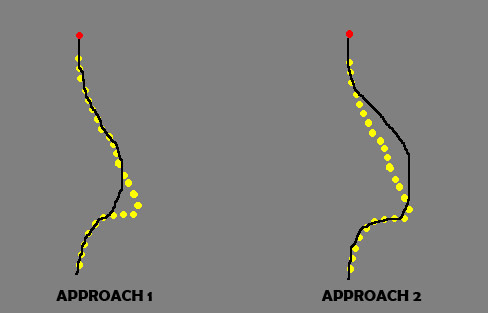 So with first try itself you got to get hang on this lag then only you will be able to choose path like approach1 which collect more dots compared to approach 2. To sum up these tests are designed to find out whether the candidate is mentally alert and has presence of mind and self confidence, adequate control over his nerves and particularly it is observed whether the candidate will be able to balance and control the flight and will not break down under stress. Candidates are advised not to be afraid of this test. Any average boy who spent time on video games can eaisly get through this set of machine tests. Note: When I searched for hints on PABT on web, I couldn’t find anything good. So I decided to post this after I am done with my test, hope this will help others not to freak out before PABT, at least you will have idea what it is, and how easy it is. This post is mainly my experience and also contents from web, it could contain mistakes so kindly point it out. Hope this help you clear your doubt. Contact me through comments and if any of you have any objection on this post then I would be glad to delete this. thats all ……………………………. « Airforce Medical Evaluation after SSB ( Indian Airforce Candidates ) . Thanks a lot. Helped in clearing my PABT. thank you!! it helped me to clear pabt.